Best Book of Week 13! If you love an authentic, well-researched, exciting historical novel that makes you almost feel like you are in the period, then I can’t recommend a better author than Dorothy Dunnett. I have been trying to get people to read her for years with the caveat that her books are challenging, not for the reader of light romantic history. Lady Dunnett is described on her Wikipedia page as a “leading light in the Scottish arts world and a renaissance woman.” Her books are loaded with detail about medieval customs, dress, politics, religion, food, and literature, and have labyrinthine plots full of action. She is most renowned for two series, the Lymond Chronicles, written in the 1960’s and 70’s and set in 16th Century Europe and Africa, and the House of Niccolò, written in the 1980’s and 90’s and set in 15th Century Europe, Asia, and Africa. 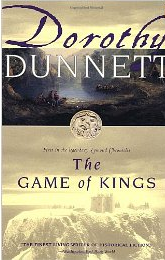 Dunnett died shortly after finishing the last book in this series. Game of Kings is the first book in my favorite series, the Lymond Chronicles. Francis Crawford of Lymond makes a rollicking and disruptive re-entrance into his home country of Scotland despite the charge of treason hanging over his head. He forms a band of outlaws and begins roaming around the countryside, sneaking across the border to play tricks on the British and harassing his own family. For quite some time, you don’t know whether he is a hero or a villain. He never explains himself, so it is left up to the reader (and the other characters) to figure out his motives for sometimes seemingly wrongful acts. His enemies think he is responsible for the explosion that killed his sister and is trying to murder his older brother Richard so he can inherit the estate. His friends are absolutely devoted to him but suffer doubts when he misbehaves, as he often does. His brother doesn’t know what to think, and his mother, Sybilla, is silent. Francis is a mimic and a rogue, a musician and a polyglot, a poet and a swordsman, as swashbuckling a character as you will ever meet with in a novel. In among the action of cattle raids, impersonations, intrigues, duels, and archery contests, you actually learn a lot about Scottish history and politics. Game of Kings is Dunnett’s first book, and my only criticism of it is that Lymond is a bit too fond of quoting poetry in antique languages. Most of it is incomprehensible unless you are a medieval scholar, but skipping over it does not hurt your understanding of the novel. Dunnett does this much less in the other books in the series. If you read this book and continue with the series, by the second book you won’t be able to stop.